Straight from our source at Mobileaks comes a new iPad Mini 2 image, a render to be precise. Last I heard, the Retina iPad Mini was delayed, because of some production problems of the display panels. 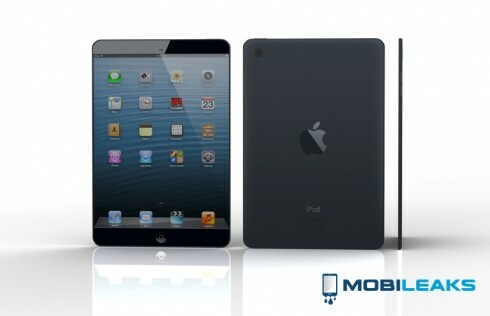 Anyway, the iPad Mini 2 rendered by Mobileaks features a 7.9 inch screen with a resolution of 2048 x 1536 pixels and 324 pixel density. There’s an Apple A6X processor inside, an 8 megapixel camera at the back and a 2 megapixel front shooter. We’ve got either 16, 32 or 64 GB of storage and a case that’s 7.5 mm thick. The edge of the display is even smaller than the one on the iPad Mini, if you ask me. It appears that although the diagonal is similar, this model will actually be more compact than its predecessor. By the way, the CPU inside it should sound familiar, since it also powered the iPad 4. So, are you impressed?